and other photographic elements in any aspect ratio you choose. 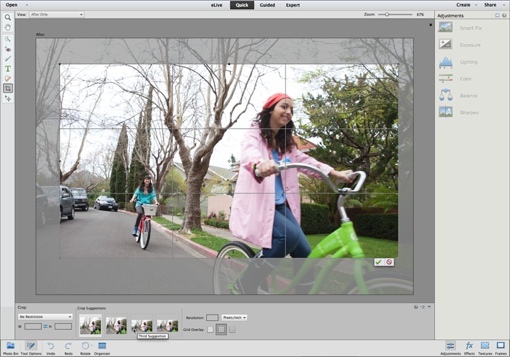 The photo-editing experts at Adobe have officially released their Photoshop Elements 13 and Premiere Elements 13 software programs. Building on last year’s Elements 12 line, the updated editors bring new tools for creating photo mashups, making perfect crops, smoothing video, and jazzing up your Facebook profile. And, as always, these Elements 13 programs do it all without the exorbitant cost of the full professional Adobe Photoshop suite. Like past releases, Adobe Photoshop Elements 13 lets you add text to photos, sharpen colors, blur backgrounds, apply filters, reduce red eye, fix blemishes and remove unwanted elements. There are great new features too, like the new auto cropping tool that suggests the best composition for your photo based on face recognition, horizontal lines, vertical lines and other aspects. I also like how Photomerge Compose now auto matches color tone and lighting variations, making it easy to merge two photos into one great shot. There are plenty of improvements waiting in the video-editing Adobe Premiere Elements 13 as well. Shake stabilization makes your movies nice and smooth, even if you’re not steady handed. A new favorite moments selector lets you mark important parts of a video for the software to automatically edit into a professional-looking movie. And if you want to create a longer piece, the new Video Story feature is perfect – you can easily storyboard family events like birthdays and weddings. Premiere Elements will suggest sequencing, types of shots, effects and transitions for you. Both Adobe Photoshop Elements 13 and Premiere Elements 13 are currently available for purchase. The Photoshop Elements is $99.99 on Adobe.com or $87.24 on Amazon; the two programs bundled together is priced at $149.99 on Adobe.com or Amazon. Upgrade pricing is also available for eligible buyers. It is a free download. Can you photoshop digital photos? What do you get in the paid photoshop express? Photoshop Express is the mobile version of Photoshop Elements and it has a fraction of Photoshop Elements’ features. Photoshop Express has basic editing, some retouching and some photo effects. It’s one of my favorites for phones, but it can’t begin to compete with Photoshop Elements. If you download the free trial of Photoshop Elements, you’ll have full access to all of the features for 30 days. So you can edit all the photos you want in that 30-day period.